I love it when a plan comes together. Although I pushed myself to get work a lot of work done during the daylight hours a few days ago, I found enough daylight to go for a brief hike. Without having a plan, I ended up again on Leif Erikson Drive. 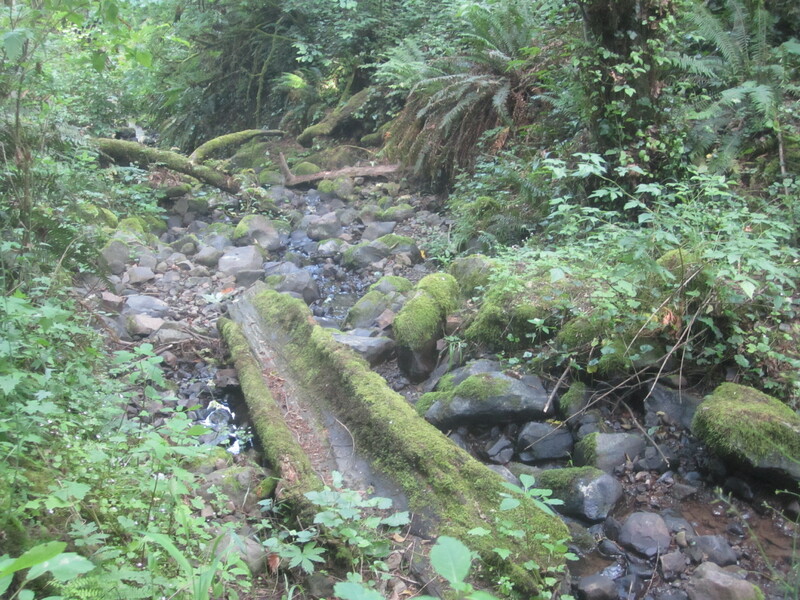 This time I headed north to the Alder Trail, 1.5 miles from my car. At that point, there is almost no traffic on Leif Erikson. 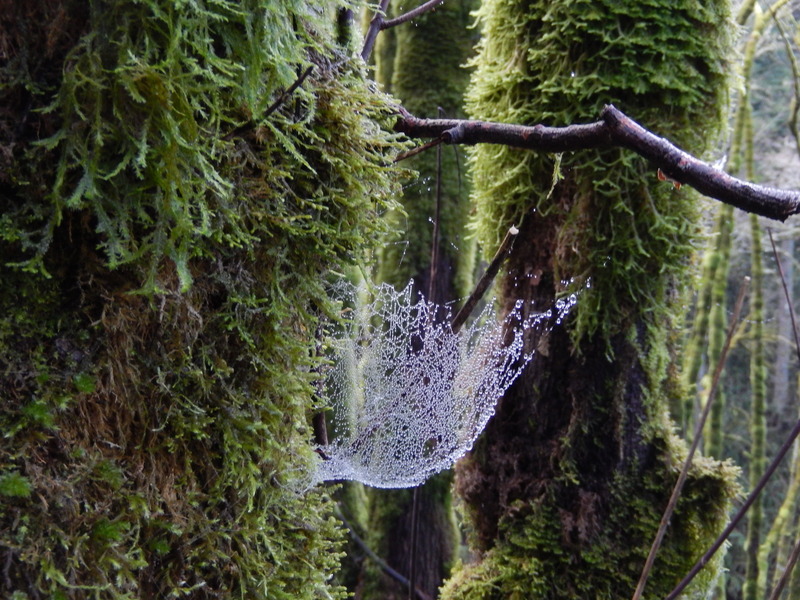 There was less on the Alder Trail. 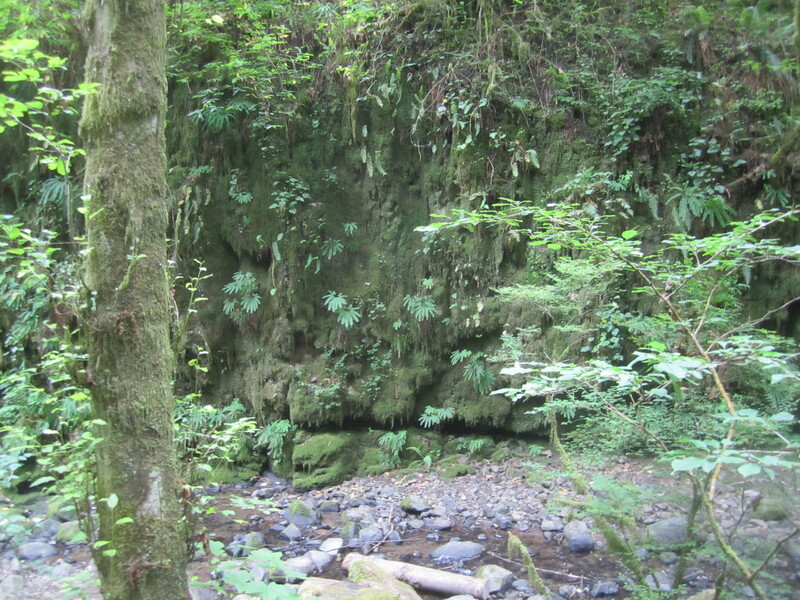 It climbed rapidly into a side canyon, then more gradually. There was a point at which I was breathing fairly heavily, which surprised me. Few trails in Forest Park will do that to you besides the Ridge Trail or the Powerline Trail. 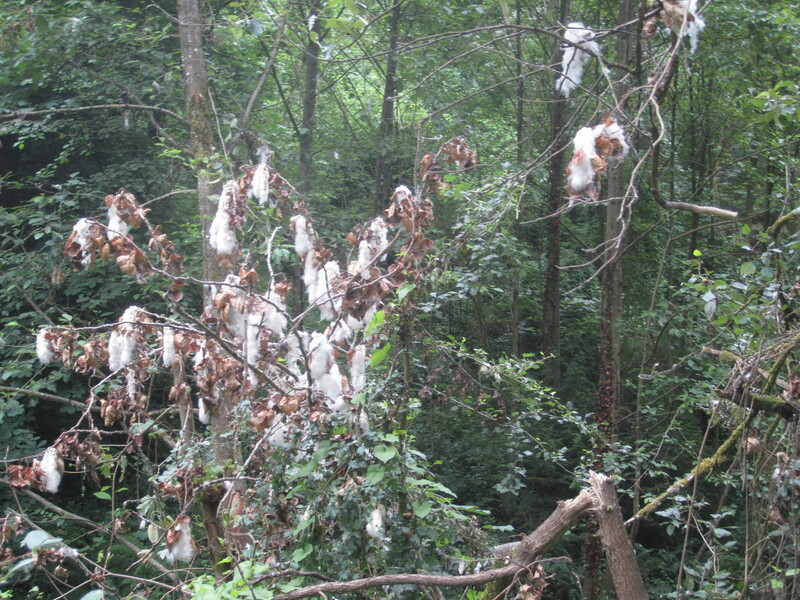 In many spots on the day’s hike I saw numerous bright white patches of Trillum. I remember wondering if the plural should be “Trillia” or “Trilliums”. Silly writing geek. I hooked back on the Wildwood Trail and headed south for about a third of mile until it hit 53rd Drive. I took a brief offshoot uphill to the spot that as a teenager, I knew as Inspiration Point. At least, I think that’s where it was. I was disappointed that it did not seem very inspiring. At sixteen, an open place in the woods must have been inspiring because it let you sneak a beer, a clove cigarette, or a kiss. I’ve grown a lot since then. So have the trees. There are essentially no views. From there it was all downhill. I encountered two interesting people on the Wild Cherry Trail. Before I’d even turned onto the trail from its terminus near my second encounter with 53rd Drive, I saw a boy about ten years old take off from the parking area, staring at what I assumed was a smart phone. He wandered down the trail for a hundred yards. I walked slowly, waiting for an adult to catch up to him. The boy then stepped off the trail, holding the phone up in front of his face. I surmised he was geocaching. He did not seem to realize Jackie and I existed. I quietly passed the lad. Ten minutes downhill, I heard big strides behind me. I pulled off to the side to let a tall man with impossibly short shorts pass on impossibly long legs. He said ‘great day to take him out,” referring to my canine partner. I agreed. And he was off. I was soon stuck behind a young couple. It seemed rude to try to pass them on a narrow trail, and I was in no rush. I didn’t try to eavesdrop, but I couldn’t help hearing a lot of twenty-something cute couple conversation. I couldn’t tell you the substance of a single utterance of either party. I couldn’t help but think how different my hiking experiences are. I almost never hike with others, and I rarely speak. They were shiny happy people, and good for them. It was a great day for all of us to get out in Forest Park. 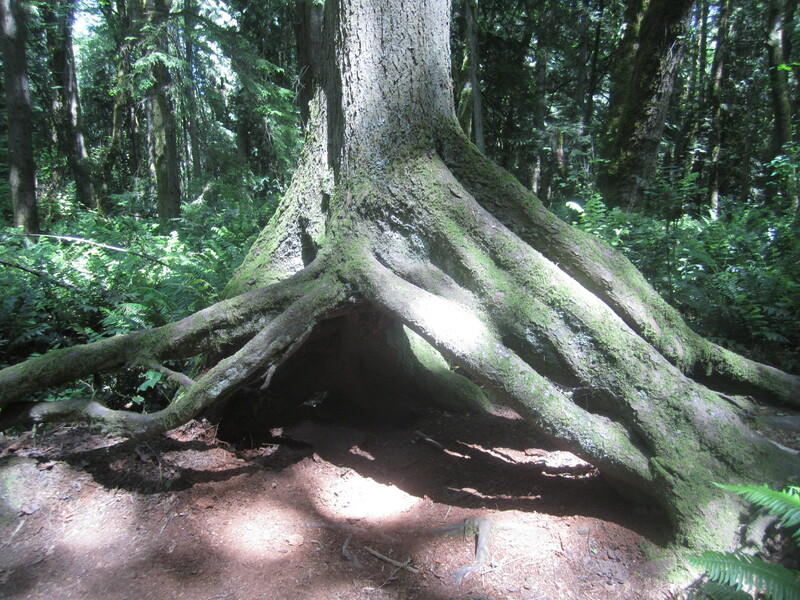 Back in the land of grey and rain, I found a bright spot in the weather and headed out to the massive Forest Park. To put the scale into perspective, the Wildwood Trail, which traverses the whole length of the park, and a bit more, is over 30 miles long. Exactly. 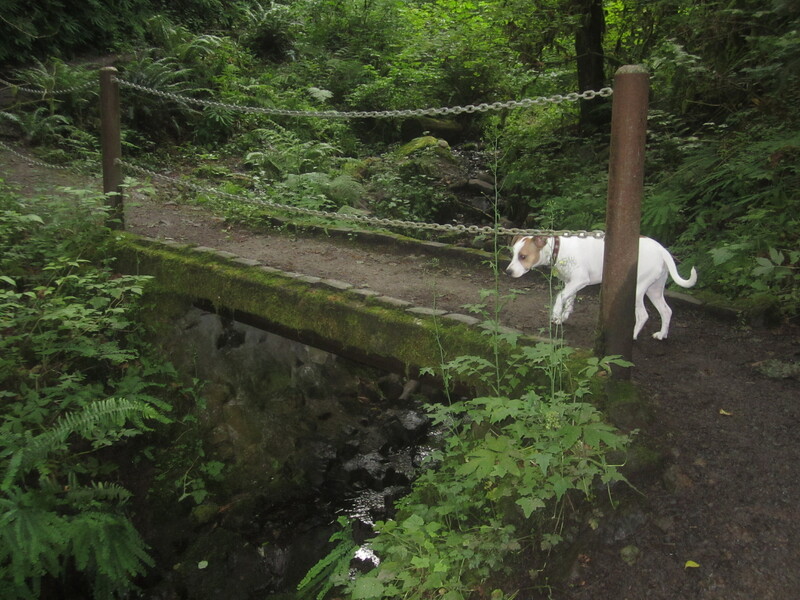 I began this jaunt with my pup at the end of Leif Ericson Drive, where I hadn’t walked in years. I turned up the Wild Cherry Trail at the first junction to get away from joggers and cyclists (not that there’s anything wrong with that). Going north on the Wildwood trail, I saw few people. One speedwalking gent wearing ear buds passed me. 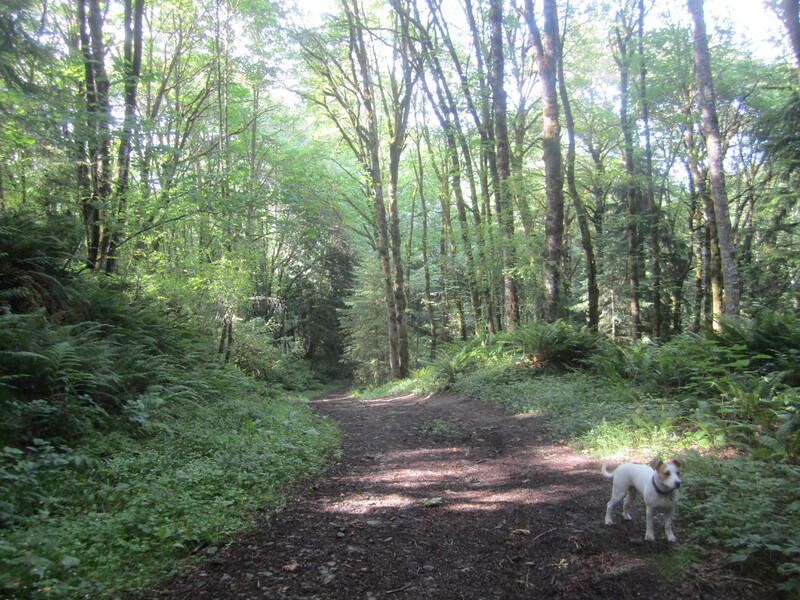 I compared notes with a couple other dog owners, then headed uphill on the Dogwood Trail. 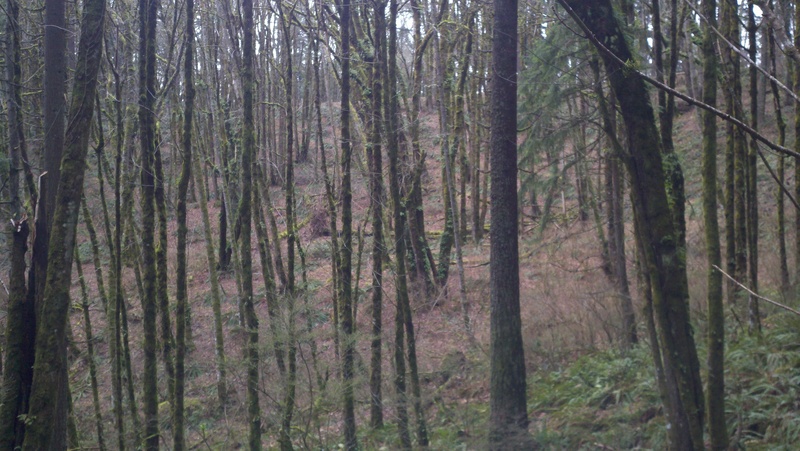 The forest was very stark in places with smaller trees and minimal groundcover. 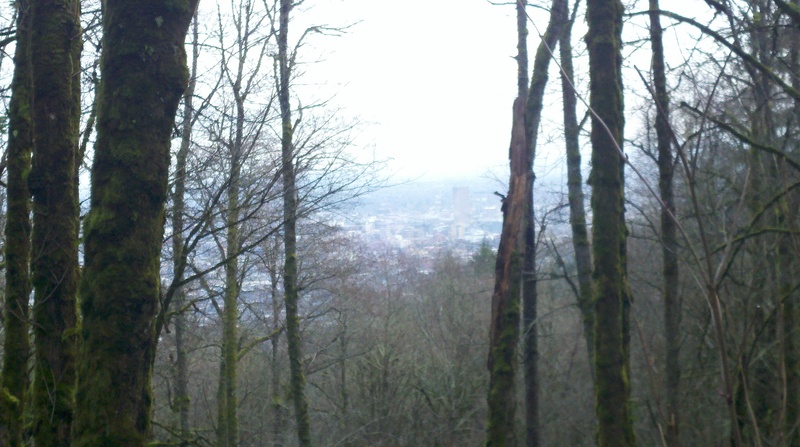 The path ended up on top of a broad ridge, and opened up a bit, where I got a couple peek-a-boo views of downtown Portland. The photos aren’t great, but I could see a skyscraper or two. Once the trail skirted a parking area on N.W. 53rd, then plunged downhill to a junction with the Wildwood Trail. I headed south this time. I saw people every few minutes, but it was a quiet day on the muddy trails. At one point, I found a great tree seemingly backlit with angel wings of ferns. Love the wing ferns on the twin tree trunks. The Aspen trail directed me back towards the car. All told, this was a decent four-plus mile loop that took about an hour and a half. 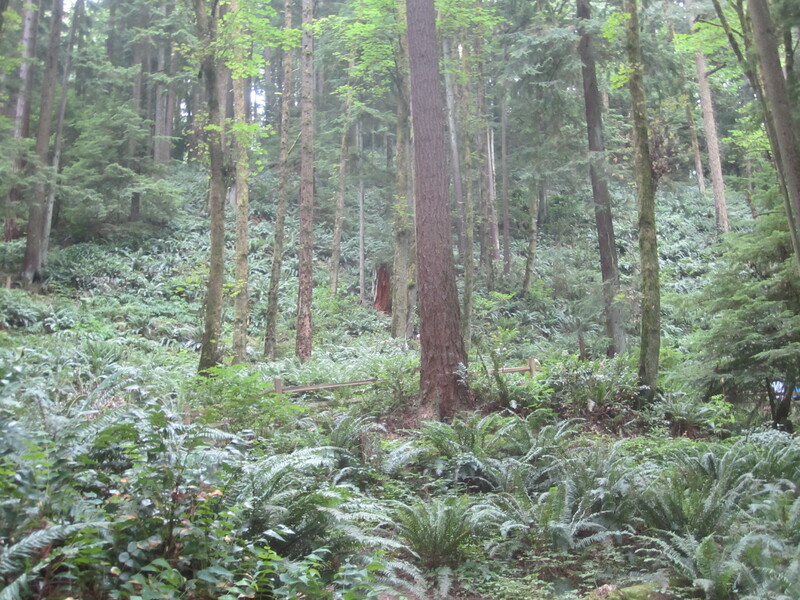 I got a bit muddy, but it felt good, and I reminded myself that no, I haven’t hiked all of Forest Park. It’s not Joshua Tree or the high Cascades, but it’s a worthy destination for an afternoon adventure. My back was stiff today, so I wanted to stretch my legs after a few hours of writing. I also wanted to procrastinate. I didn’t know if the trails would be muddy, or if it would rain on me, but it seemed worth it. Shockingly, I found myself on the Wildwood Trail off Germantown Road. 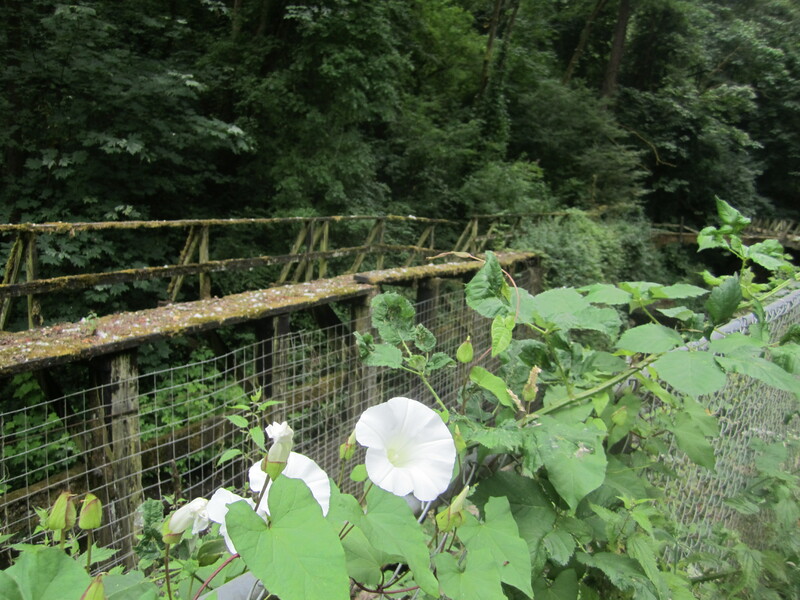 I linked that with Firelane 10 and the Keyser Trail to make a loop. At one point the sky seemed sunny, near the high point, where I saw one of the two people I encountered in an hour. The temperature was almost perfect. As I descended to a low point on the firelane, the fog was almost surreal. The trail was a little slick in spots, so I had to be careful. Jackie was good about staying with me, seemingly wondering what the deal was with the fog. Making the turn and heading back up the firelane, the going got tough, but the hardest part may have been crossing back over the road. Traffic on Germantown is relatively heavy for a windy road. Hikers and dogs beware. All right, this fog is rather strange, Jackie says. 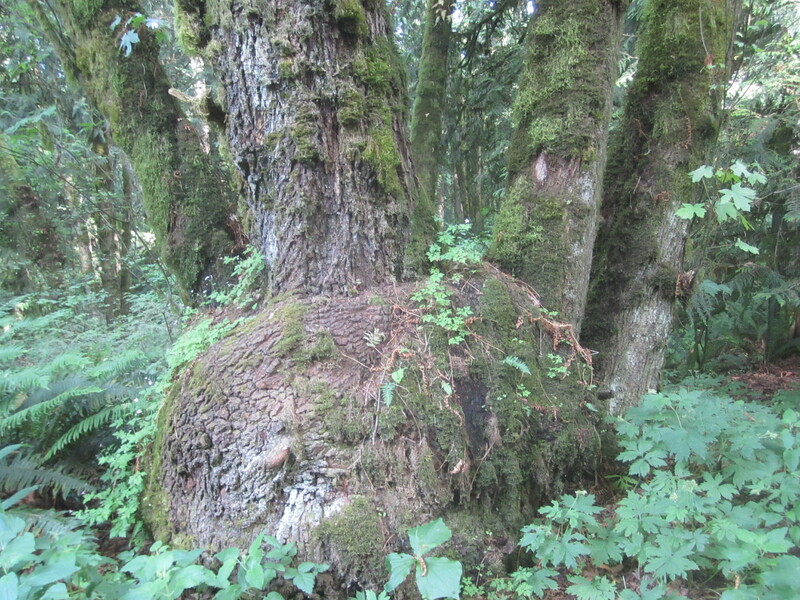 Will The Real Classic Oregon Tree Trunk Please Stand Up? Normal forest, normal trail. I’ll take it. I left the Germantown Road trailhead this afternoon to repeat an old hike I’d done for a quick burn. Heading south with Jackie Chan almost two miles on the Wildwood Trail, I enjoyed a peaceful walk and focused on the trees beside the trail and the muddy track. At a fire lane, I passed a bunch of city wheelbarrows chained to a tree and dropped down to Leif Ericson Drive. There are no views, but the forest has some pretty spots, and I considered the various classic tree trunks typical of the area. For some strange reason, as I looked at the various trees, I was reminded of the old game show To Tell the Truth wherein three people all pretended to have the same name, and panelists asked them questions to determine who was telling the truth. At end of a round, the host would unveil the real person. 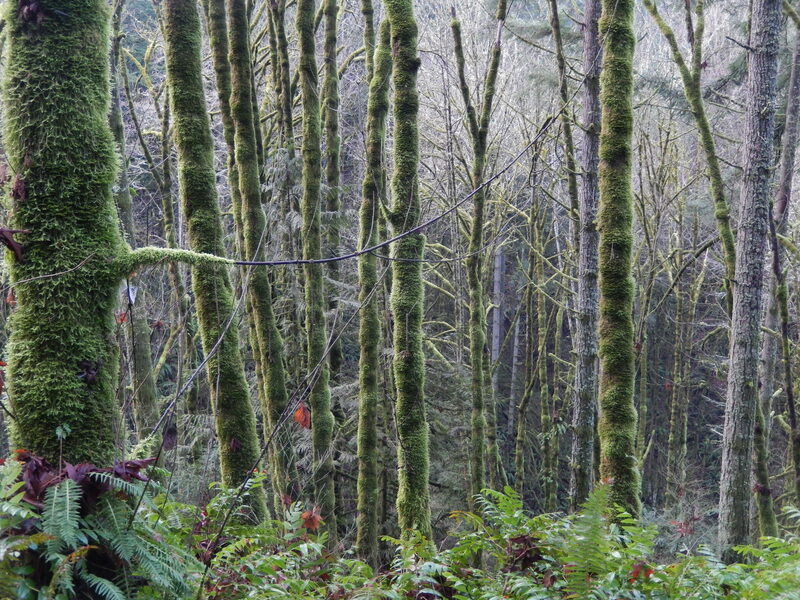 So which one of these could be considered the classic Oregon tree trunk? I asked the forest, but received no reply. Strange. 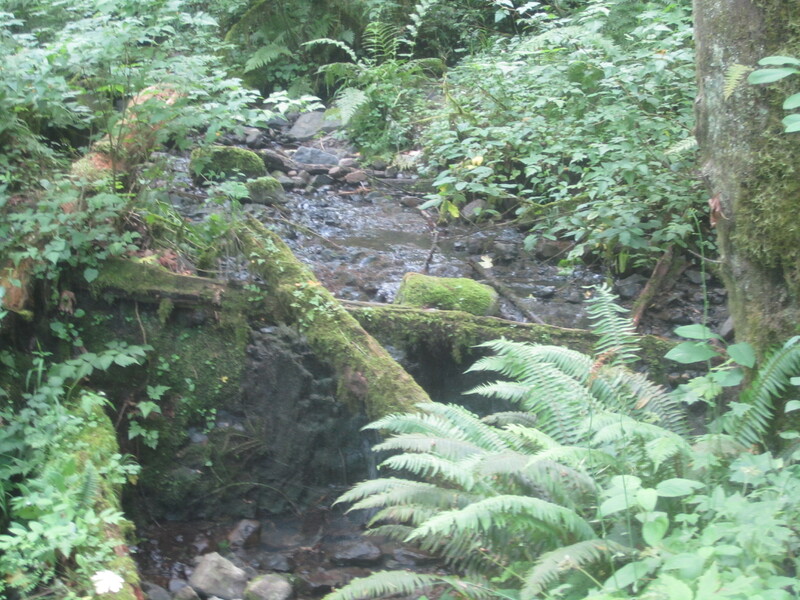 I might have to return to Forest Park or nearby spots for further investigation. It always feels like a treasure to escape the mundane world of buy and sell, toil and strive, in such a lovely park within the city. Jackie Chan says “I’m the only classic Oregon anything around these parts!” He’s a bit biased. I’ve been biting off bits and pieces of the Wildwood Trail for years, and this year I think I completed all of it but about two miles, scattered here and there. That’s 30.25 miles of forest beginning across a parking lot from the Zoo. Pretty amazing stuff for a city park. 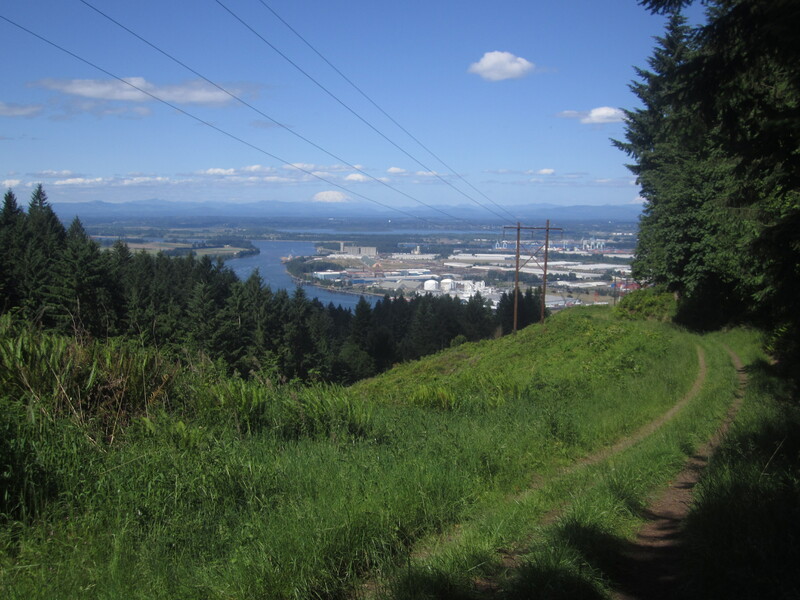 It’s one more way Portland resident are lucky in terms of outdoor recreation. I’ve been considering trying to do a one day hike of the Wildwood, but I’m not sure my knees are up to it. The trail isn’t particularly difficult, but 30 miles in one day is a lot for most ordinary human beings. While I ponder the possibilities, here are a few photos from that far end of the trail. Even on a short hike in what seems like familiar terrain, it is easy to spot new vistas and interesting details that might otherwise go unnoticed. The Wildwood Trail is always good for a short or long venture. Stay tuned for a post on the famous Dog Mountain. Happy hiking. In between rounds at the Waterfront Blues Festival, I needed a decent hike, but I had little time, which was frustrating. I always have the fantasy of trekking in Nepal or circumnavigating Mont Blanc, but most of my hikes are local and casual. So it goes. 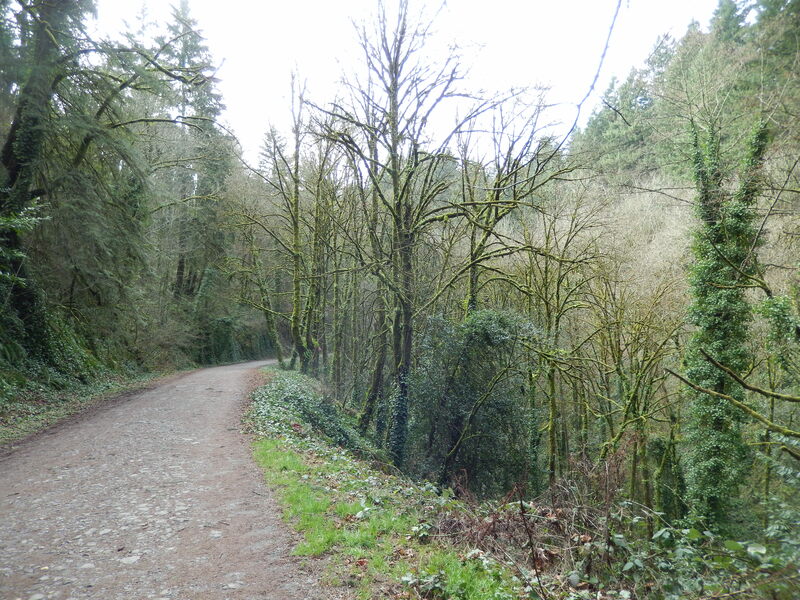 Yesterday, I opted to start in Lower Macleay Park, as I have done in the past, seeking what passes for elevation gain inside Portland city limits. By the time I had cruised three quarters of a mile along Balch Creek and joined the Wildwood Trail, I’d passed 25-35 people. This is not the trail for solitude on a weekend. Normally I would avoid it on a weekend, but it is close, pretty, and still offers a challenge. 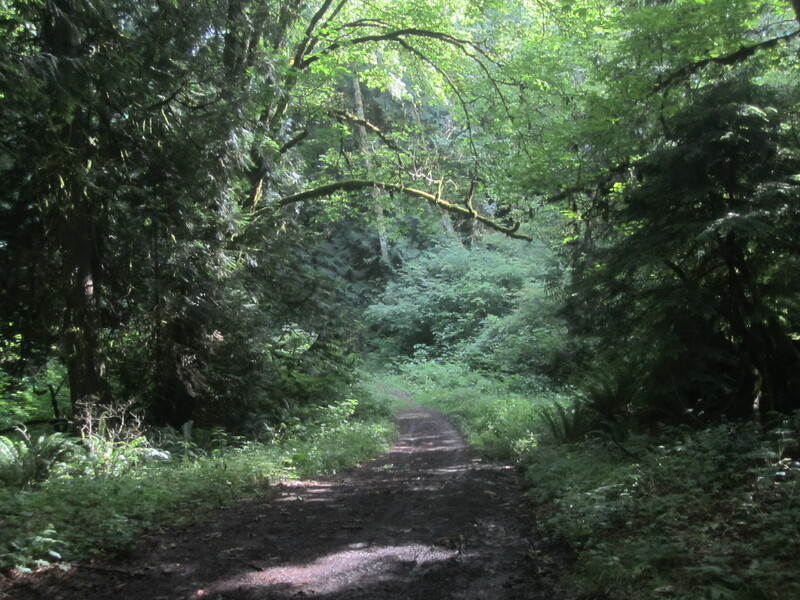 The Wildwood Trail climbs in half a mile to the Audubon Sanctuary on Cornell Road, then continues toward Pittock Mansion. There are a couple of trail junctions, including one which called to mind my recent trip to Maryland. Many people were walking and running in the forested hills, over many switchbacks. Running shoes were definitely the footwear of choice. With few exceptions, the trail is very smooth and make for easy walking, although effort is required. All told, there is around almost 900 feet of elevation gain. Not bad for inside the city limits. The Pittock Mansion is a unique destination for the top of an ascent. It is a great old building, and there are spectacular views to the east. Should you desire, you can drive up and pay for guided tours through the mansion, learning a chunk of Portland history. I took a quick look at the building and turned around. Here’s a fun bit of trivia: Henry Pittock, for whom the mansion is named, and who was an avid outdoorsman besides being publisher of The Oregonian, is credited by most with the first ascent of Mount Hood, on July 11, 1857. I think my hike just got more credibility. 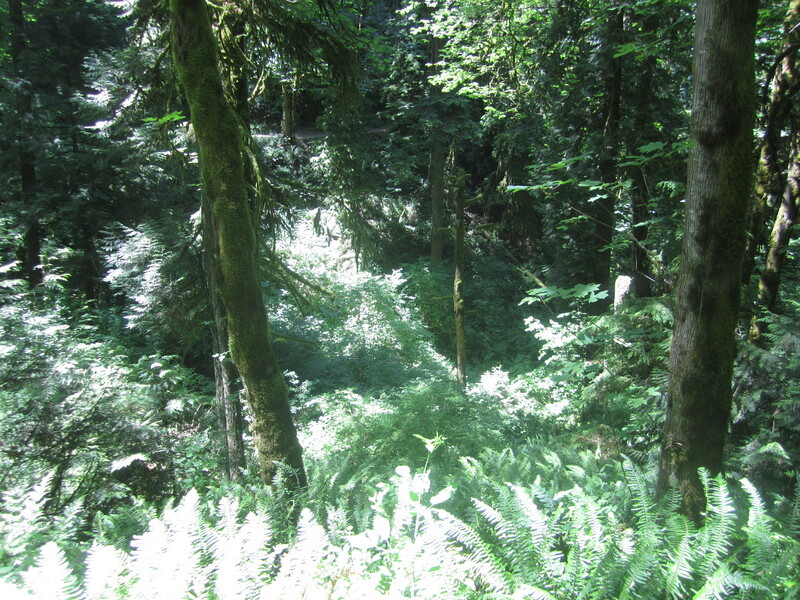 On the descent, I veered onto the Upper Macleay Trail to make a bit of a loop. 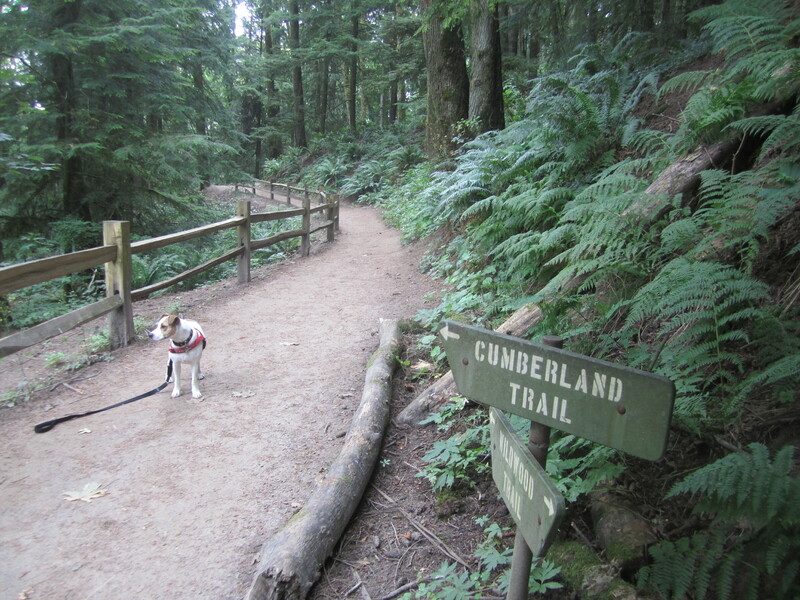 It was pleasant, but offered little to recommend it over the Wildwood Trail. I made good time back to the Cornell Road crossing and then to the bottom of Balch Creek Canyon, where the crowd increased. I was happy to return to the car, and soon, drove to the Blues Festival for the closing night. My wife and I love going each year, and this year we brought our pup into the fest. This year’s festival, while not without controversy for a couple reasons, was as good as any in recent memory. Try this variety and talent on for size: Nikki Hill, Robert Randolph, Mavis Staples, Chubby Carrier, and Taj Mahal. And that’s just one day. 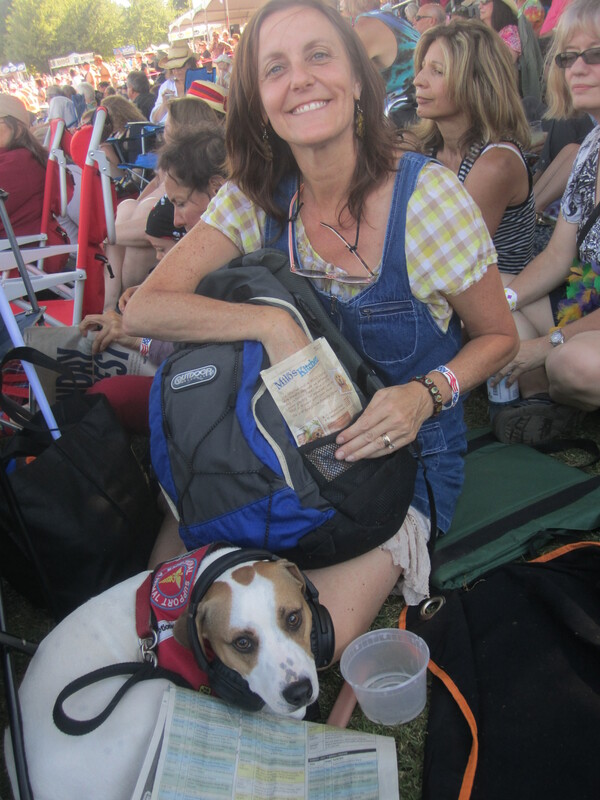 D and Jackie with earmuffs–Robert Randolph was loud! There was also some guy named Robert Plant singing a ditty about a whole lot of love. He did many familiar songs, including a great cover of “Spoonful,” and some Zeppelin songs were reworked with more of a world music feel. 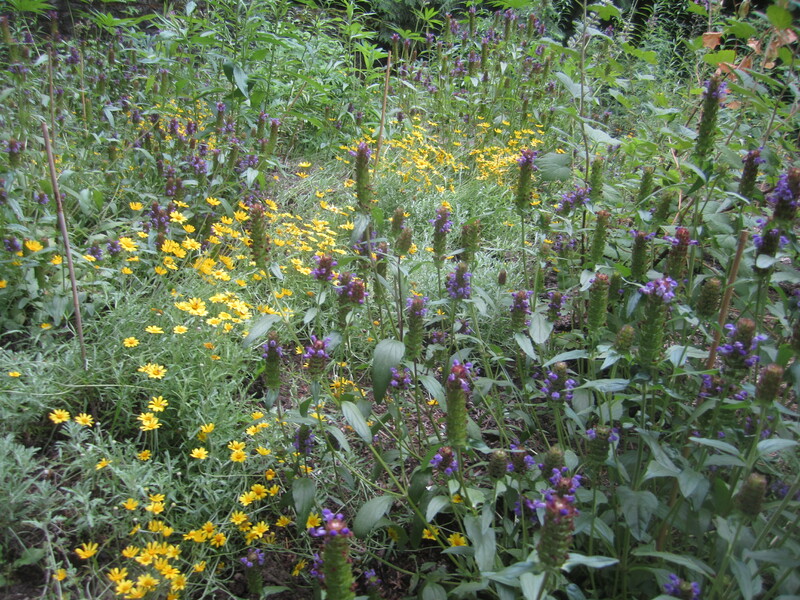 Amazingly, Plant still has the magic. After seeing Eric Burdon a couple nights earlier singing “It’s My Life” and “House of the Rising Sun”, and now hearing Plant sing “Babe, I’m Gonna Leave You” and “Whole Lotta Love”, I ticked off a bucket list item without planning on it. What a weekend. Sometimes the destination we seek is impossible to attain, and what actually transpires on a journey can be more important than what’s on the original itinerary. But enough sophomoric philosophy. How about some hiking? 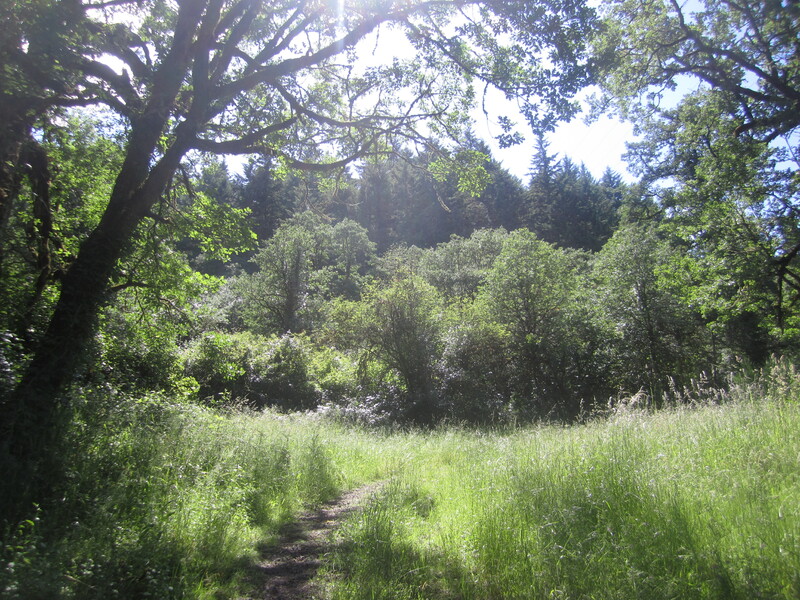 This afternoon I headed toward a particular trailhead, and while enroute, I discovered the Linnton Trail. Dare I say that I took the path less traveled, and it made a heck of a difference? Okay, probably not. I shouldn’t mangle the poet’s intent, as many do. The Linnton Trail takes off from a small parking area behind a bus stop on Highway 30. It follows a creek for a short distance, then crosses it and heads into some switchbacks. At some point, I started hearing voices, and assumed I’d meet other hikers, but I never encountered them. It turns out there is a neighborhood just over the ridge, and as I climbed, I realized I was hearing children playing. I was reminded of a lyric by ‘Til Tuesday: “voices carry”. Once across creek, Jackie and I put some effort into it. A fair amount of elevation had to be gained. I tried to guess how far I was from the trail I’d last weekend. Later, I would figure it out. The Linnton Trail eventually runs into Firelane 10, which is going straight up the hill then. I found a pleasant loop detour called the Keyser Trail, which seems designed for mountain bikers who don’t want to deal with a steep pitch on their bike. It rejoins Firelane 10 in three tenths of a mile. Shortly after that, the fire lane intersects with the Wildwood Trail. This was the section I had hiked when headed to the Powerline Trail. 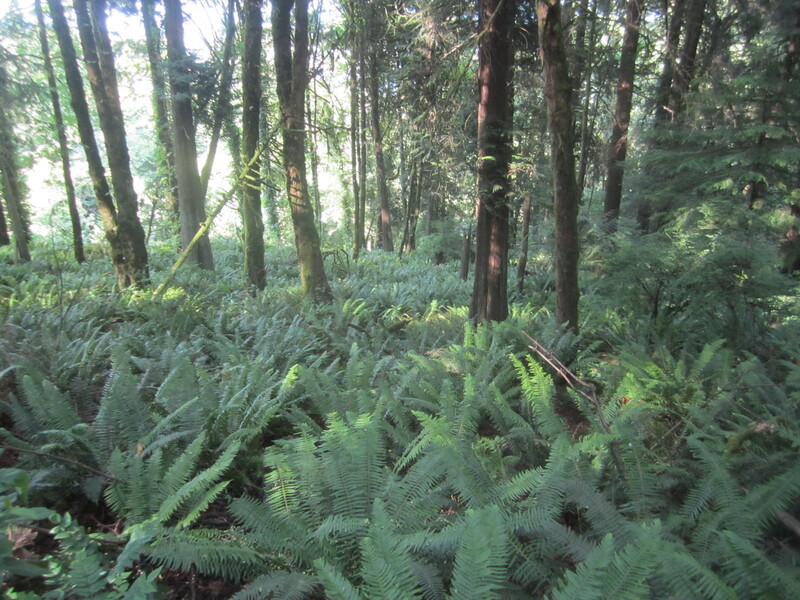 Today, I was content to simply head back downhill, taking photos of bulbous tree bases, moss thick enough for pillows, and wonderful light striking ferns. My trail choice may not have made all the difference, but the Linnton Trail is certainly worthwhile for a quick afternoon hike. Hikers on it will burn some calories and see some pretty forest. It’s also good for solitude. I only saw two boys at the very bottom of the trail, just as I was returning to the car, pleased with myself yet again as I pondered what larger hike to tackle soon. Ah, choices! P.S. This is the one year anniversary of my blog. I’m not hip or brilliant or tech savvy enough to have 10,000 followers yet, but I appreciate those I do have. Thanks for reading. Pass it on, and more importantly, get out there and hike, climb, run, bike, ski, or whatever you like to do outside. Cheers. I was torn today between checking out a new spot to hike and getting the dog out. 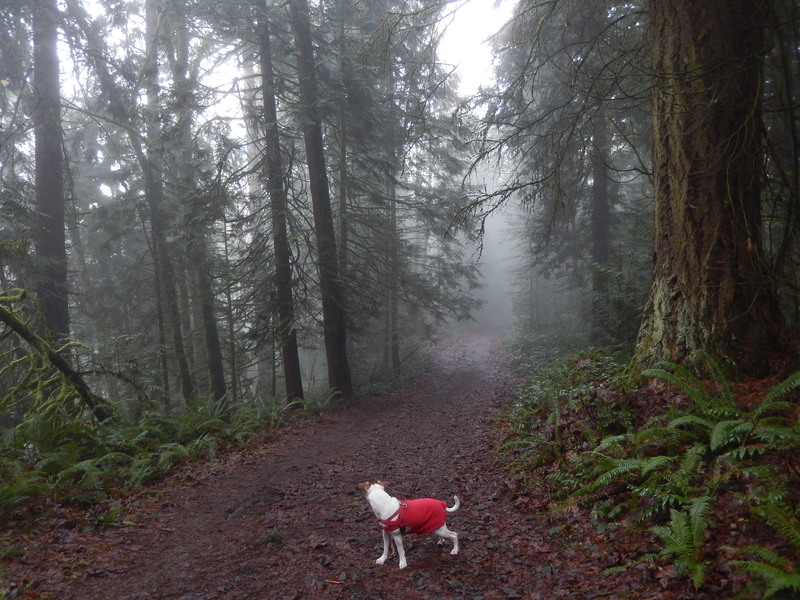 Mount Talbert didn’t allow dogs. The species discriminators strike again! So I blew it off and drove toward Forest Park so I could bring Jackie Chan. 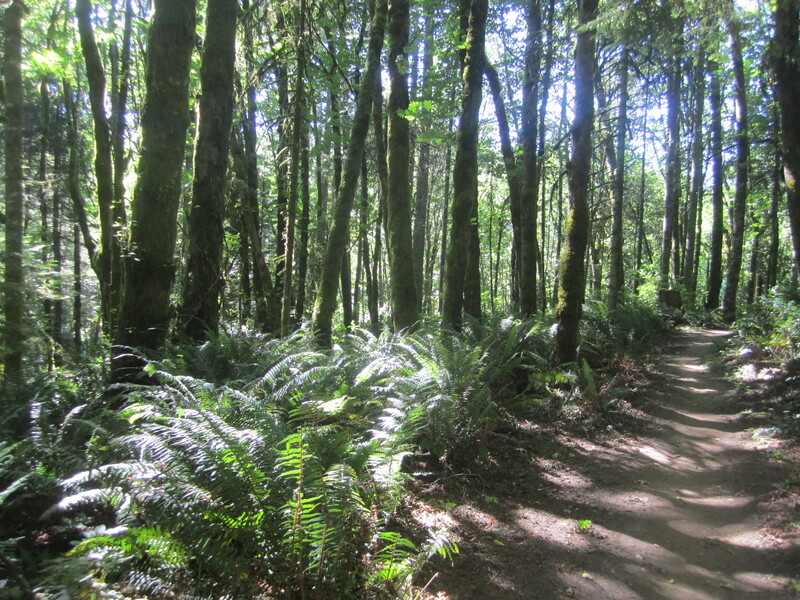 The trailheads on Germantown Road were relatively crowded, so I headed north on the Wildwood Trail. Good thing, too. The Wildwood Trail is always relatively popular, but my theory is that north of German town would be more quiet. I certainly saw some traffic, but not much. When I hit Newton Road a little over a mile from the trailhead, I took a quick look at the map posted at major intersections. I saw loop potential and headed downhill toward the bottom of the BPA Road. I then lost a good 500 feet of elevation as the trail almost went down to Highway 30. As the bottom, Newton Road (which felt like a firelane until close to the bottom) opens up in a meadow where a single runner passed us. Then we saw no people for 30 minutes. 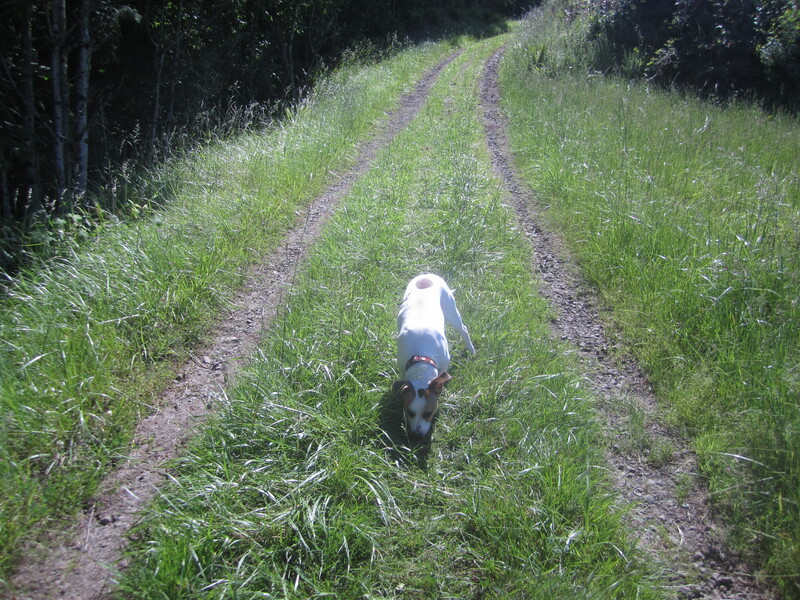 I found the BPA road and headed up the gravel and grass track. I assume the road is named for the Bonneville Power Administration, as it gives access to the powerlines. Parts of the path were quite steep and I took my time. Since I was in the sun now, I started sweating like the water glass on my bedside table at night (reading World War Z right now). 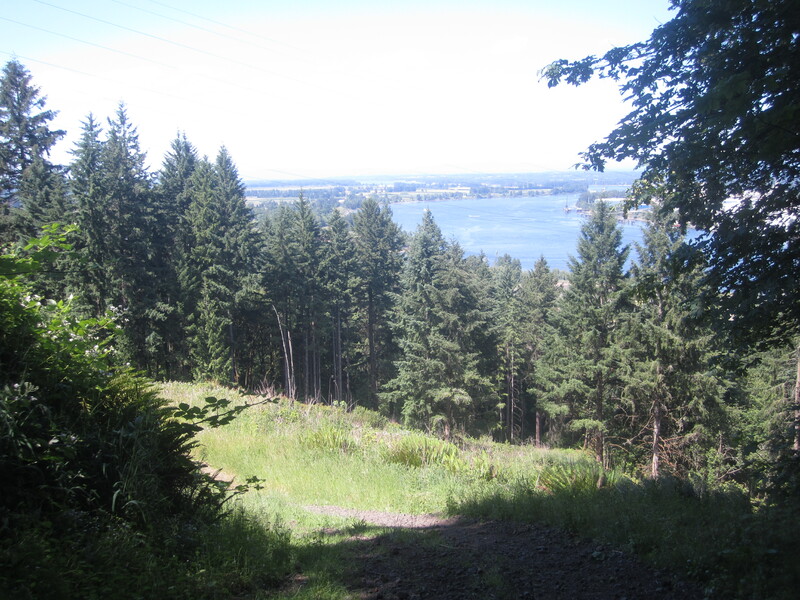 Looking back toward the Willamette River and beyond to the Columbia, views started getting tremendous: Mt. St. Helens, Mount Adams, and more. My vantage could fool people. Without a shot of downtown, many residents probably wouldn’t know it was Portland below. The climb uphill was longer than expected, but it was very pleasant, and then there was rolling open terrain as we closed back in on the Wildwood Trail. This felt nothing like the rest of the lovely but darky wooded Forest Park, and that made it a treat. y Jackie had time to smell the crabgrass while I plodded: steeper than it looks. This hike was a nice surprise. The Newton Road and BPA Road was a solid four mile loop that had few walkers or runners, and the latter half had a unique feel due to the open nature. 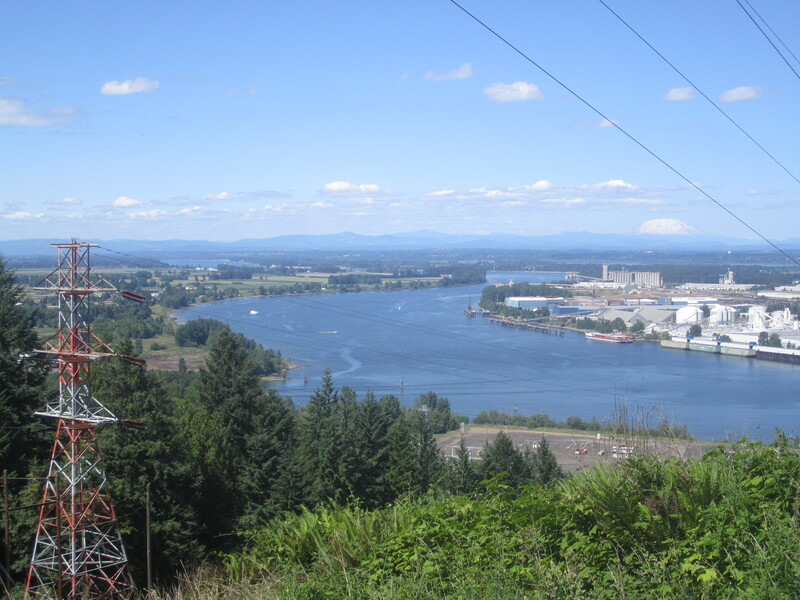 Powerlines are not the most aesthetic landscape feature on a hike, but I felt thankful that I could safely walk along them, enjoy the view, break a healthy sweat, and just think. It turned out to be a seven mile hike– just the right length for an afternoon. Near the end of the hike I noticed a placard near the ground with a quotation from the famous Vietnamese monk, Thich Nhat Hanh, in honor of someone who died in 2003. 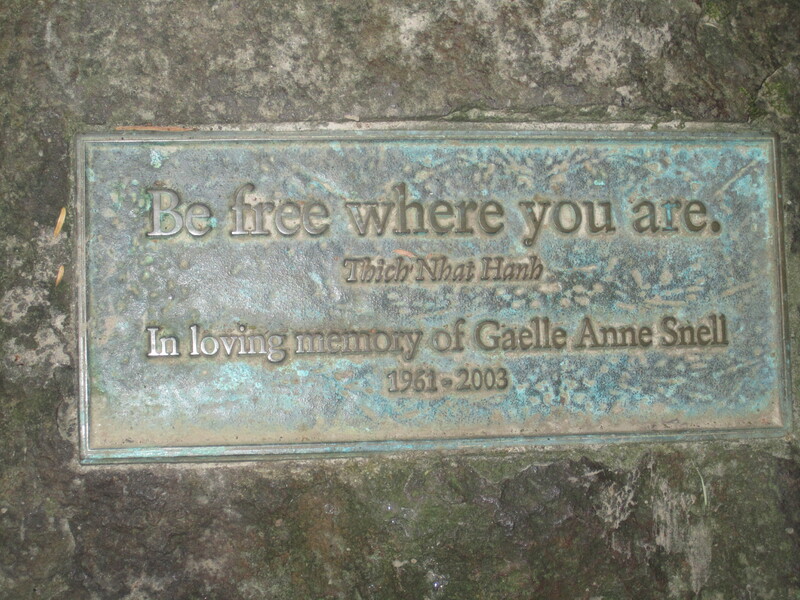 It read “Be Free where you are.” I contemplated where I was, where I had been, powerlines and all, and I felt a little freer. P.S. In a tiny piece of only slightly forced synchronicity, I realized this evening that a new foodcart down the street offers Vietnamese cuisine. 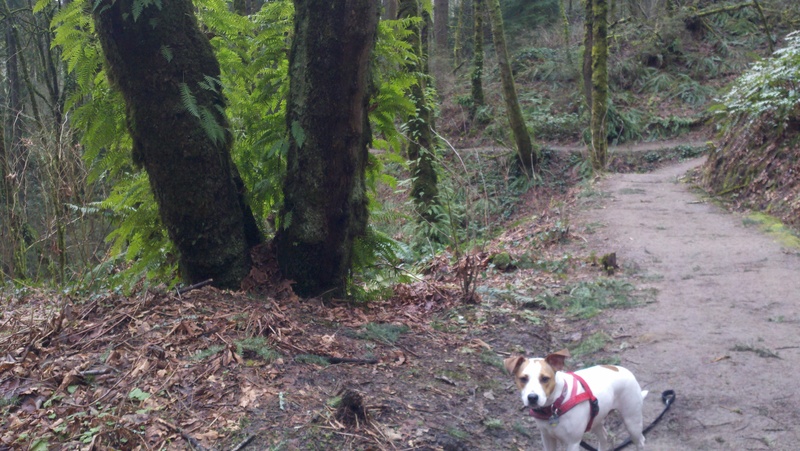 Posted in General Hiking, Hiking with dogs, Uncategorized.